15 squat cleans, 95 lb. 13 squat cleans, 115 lb. 11 squat cleans, 135 lb. 9 squat cleans, 155 lb. 7 squat cleans, 185 lb. This workout begins with the athlete standing under the pull-up bar. 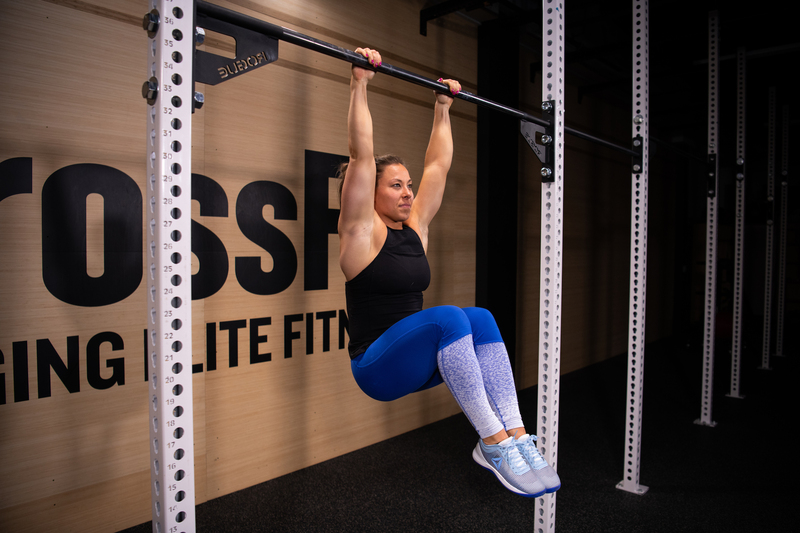 After the call of “3, 2, 1 ... go,” the athlete will have 8 minutes to perform 25 toes-to-bars, followed by 50 double-unders and 15 squat cleans, then perform 25 toes-to-bars, 50 double-unders and 13 squat cleans, this time at a heavier weight. If the athlete does not complete all 178 repetitions within 8 minutes, their workout is over. The athlete will stop and record their score. If all 178 repetitions are completed within the 8-minute window, the athlete will earn an additional 4 minutes to perform another 25 toes-to-bars, 50 double-unders and 11 squat cleans, again at a heavier weight. If all 264 repetitions (90 from round 1, plus 88 from round 2, plus 86 from round 3) are completed by the 12-minute mark, the athlete will begin another round and the time cap will be extended by an additional 4 minutes. Each round, the weight of the clean will increase while the reps of the clean decrease. Once a round is completed, the athlete may immediately begin the next round. The athlete does not need to wait for the 4-minute round to end before moving on to the next round. This pattern of earning additional time will continue for up to 20 minutes, as long as a full round is completed before the next cutoff. This workout is over when the athlete fails to complete all the repetitions within the cutoff time for that round. The final round ends at the 20-minute mark. The athlete’s score is the number of repetitions completed up to their cutoff time. 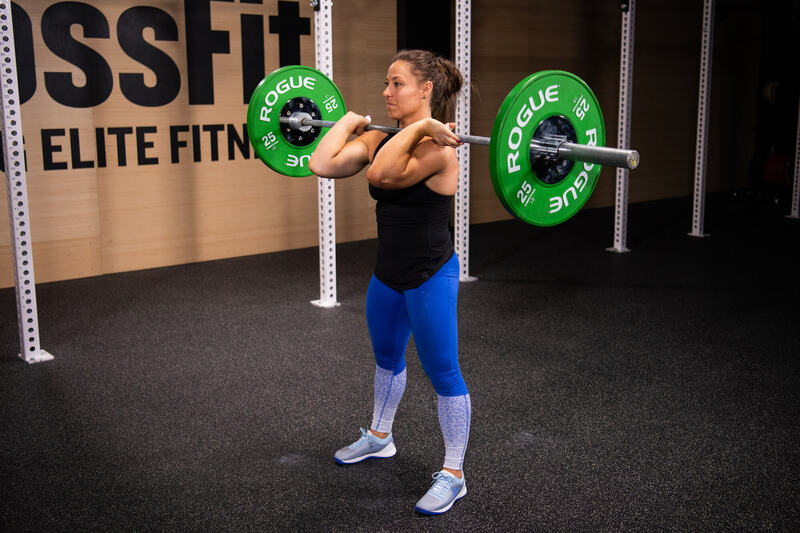 In this workout, another person may assist the athlete in changing the plates on the barbell during the workout, or multiple barbells may be used. Collars must be placed on the outside of all the plates on any bar used during the workout. *The official weight is in pounds. For your convenience, the minimum acceptable weights in kilograms are 20 kg (45 lb. ), 25 kg (55 lb. ), 29 kg (65 lb. ), 34 kg (75 lb. ), 38 kg (85 lb. ), 43 kg (95 lb. ), 47 kg (105 lb. ), 52 kg (115 lb. ), 56 kg (125 lb. ), 61 kg (135 lb. ), 65 kg (145 lb. ), 70 kg (155 lb. ), 79 kg (175 lb. ), 83 kg (185 lb. ), 93 kg (205 lb. ), 102 kg (225 lb. ), 124 kg (275 lb.) and 142 kg (315 lb.). The scoring for this workout includes a tiebreak. At the end of each set of double-unders, time should be marked. When you submit your final result, your score will be the number of reps completed. There will be another field where you will enter the elapsed time at which you completed your last set of double-unders. In the case where two athletes have the same score (total number of reps), the athlete with the lower tiebreak will be ranked higher. If all 5 rounds are completed in under 20 minutes, your score is the total time it takes you to complete the workout. Note: All tiebreak times must be reported in elapsed time, not in time remaining. Do not use a countdown timer. All video submissions should be uncut and unedited in order to accurately display the performance. Prior to starting, film the pull-up bar, plates and barbell to be used so the loads can be seen clearly. Your judge and a clock or timer with the running workout time should be clearly visible throughout the entire workout. Shoot the video from an angle so all movements can be clearly seen meeting the movement standards. Videos shot with a fisheye lens or similar lens may be rejected due to the visual distortion these lenses cause. In the toes-to-bar, the athlete must go from a full hang to having the toes touch the pull-up bar. At the start of each rep, the arms must be fully extended and the heels must be brought back behind the bar. Athletes may wrap tape around the pull-up bar or wear hand protection (gymnastics-style grips, gloves, etc. ), but they may not tape the bar AND wear hand protection. Overhand, underhand, or mixed grip are all permitted. The rep is credited when both feet come into contact with the bar at the same time, between the hands. Any part of the feet may make contact with the bar. This is the standard double-under in which the rope passes under the feet twice for each jump. The rope must spin forward for the rep to count. Only successful jumps are counted, not attempts. The barbell begins on the ground. Touch and go is permitted. No bouncing or dropping and catching the barbell on the rebound. Once dropped, the barbell must settle on the ground before the athlete begins the next repetition. The athlete must pass through a full squat with hips below the knees. Receiving the barbell in the bottom of the squat is not required; a power clean or split clean followed by a front squat will be permitted, but a deadlift followed by a hang clean is not allowed. The rep is credited when the athlete’s hips and knees are fully extended, and the bar is resting on the shoulders with the elbows in front of the bar. 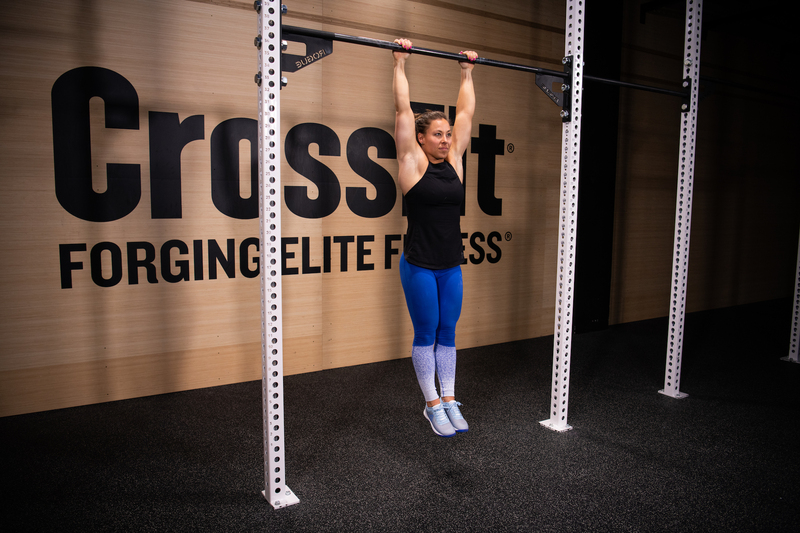 Scaled athletes and scaled teens may perform hanging knee-raises. In the hanging knee-raise, the arms and hips must be fully extended at the bottom and the heels must be brought back behind the bar. Overhand, underhand, or mixed grip are all permitted. The rep is credited when the knees are above the height of the hips. For scaled masters, each rep of the sit-up begins with the athlete’s back in contact with the floor, the knees bent with the feet anchored, and the hands touching the floor above the head. The rep is credited once the athlete raises their torso until the hands touch either the toes of the dumbbells. AbMats are permitted. For scaled divisions, this is the standard single-under in which the rope passes under the feet once for each jump. The rope must spin forward for the rep to count. Only successful jumps are counted, not attempts.